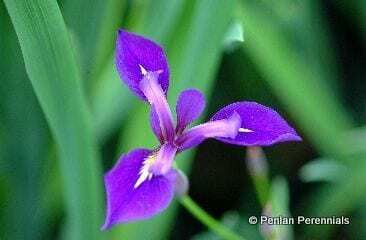 A hybrid of Iris virginica and Iris versicolor with dark violet flowers on tall stems in mid-summer. This is a vigorous plant, forming stout clumps, with the base of the leaf stems a striking purple colour on mature plants. For moist to wet soils in full sun or it can be planted as an aquatic marginal in 10cm/4ins of water. Pot size 1.5 litre. Remove spent flowers and tidy old foliage in spring. Plants can be divided in early spring or late summer after flowering. They should be planted shallowly with the rhizime on, or just under, the surface. Pest and disease resistant. Needs no staking.